The Paramo Velez Adventure Smock is a multi-activity directional waterproof. The Nikwax Analogy Waterproof fabric feels very different to the membrane fabrics we are more used to seeing in waterproof jackets. It feels softer and more comfortable to wear on the whole. The Nikwax Analogy Waterproof fabric itself works well to move sweat away from your body and keep rain from getting in, however this performance is somewhat compromised by the overall design of this smock. As Paramo don’t use water resistant zips water can quite easily penetrate through (anything more than a light shower), by using inner mounted baffles it means the water is then already inside the jacket. Whilst the baffles do have poppers to draw them across they are largely ineffective against the amount of water that is easily able to penetrate through. This leads to three very noticeable areas where water seems to pour through (The main zip and the two-venting zips). When the jacket was new this was less noticeable however through normal usage and despite fastidious reproofing the zips are still weak points. It is worth pointing out that many other items in the Paramo range feature either external baffles, better inner mounted baffles or a combination of both which should help to alleviate this problem. After the zips the next main weak point for water getting in is the cuffs. The cuffs on this particular Paramo top do not feature the pump liner; as a result water can quite easily make it through the microfibre outer and the stitching around the cuff. Whilst seemingly insignificant as the cuff opening is only a matter of a few centimetres away it means that water can too easily get in around your wrists and with no pump liner to push it outwards it remains there. 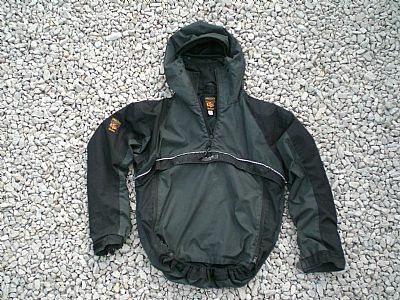 The cut of the jacket is described by Paramo as a closer, contoured fit; however it is far baggier than most other manufacturers’ closer fits.This is especially the case under the arms, where the cut of the fabric leads to bad arm lift. This means whenever you lift your arms above shoulder height the hem of the smock lifts up leaving a billowing of fabric. A great comfortable waterproof fabric that works well, let down by the zips and to a lesser extent cuffs that allow water through in anything more than a light shower make this smock hard to recommend to anybody other than someone who likes to wear their waterproof only in nice weather.